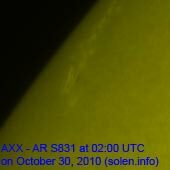 Last major update issued on October 31, 2010 at 03:40 UTC. The geomagnetic field was quiet on October 30. Solar wind speed ranged between 347 and 421 km/s. A sudden increase in the total interplanetary magnetic field at ACE near 09:15 UTC was followed by a weak sudden impulse at Earth near 10h. 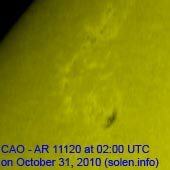 This was likely the arrival of the CME observed on October 26. 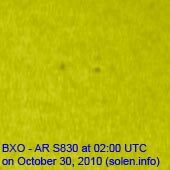 Solar flux measured at 20h UTC on 2.8 GHz was 84.8 (up 4.8 over the last solar rotation). The planetary A index was 2 (STAR Ap - based on the mean of three hour interval ap indices: 2.1). Three hour interval K indices: 00011200 (planetary), 00011301 (Boulder). 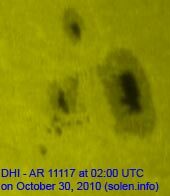 Region 11117 decayed further and will rotate to the northwest limb today. 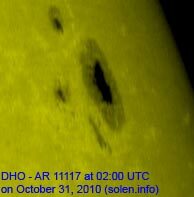 New region 11120 rotated partly into view on October 29 and was numbered the next day by NOSAA/SWPC. October 28-30: No obviously Earth directed CMEs were seen in LASCO or STEREO images. No obvious coronal holes are currently in or near Earth facing positions. An extension of the southern polar coronal hole rotated across the central meridian on October 27-28 but was probably too far to the south to cause a disturbance. 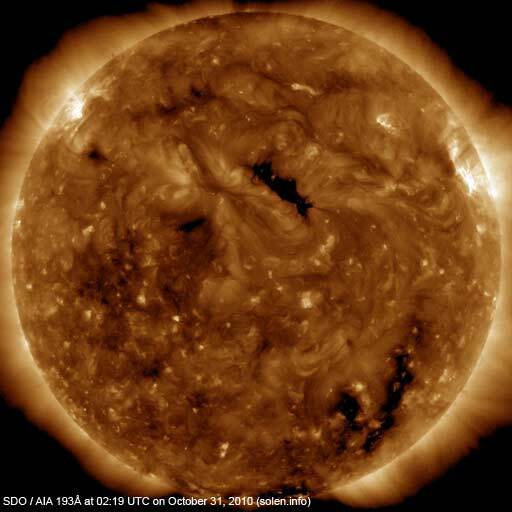 Another coronal hole in the northern hemisphere may have been in an Earth facing position on October 30 but was probably too far to the north to become geoeffective. The geomagnetic field is expected to be quiet to unsettled on October 31 due to weak effects from the CME which reached Earth on October 30. 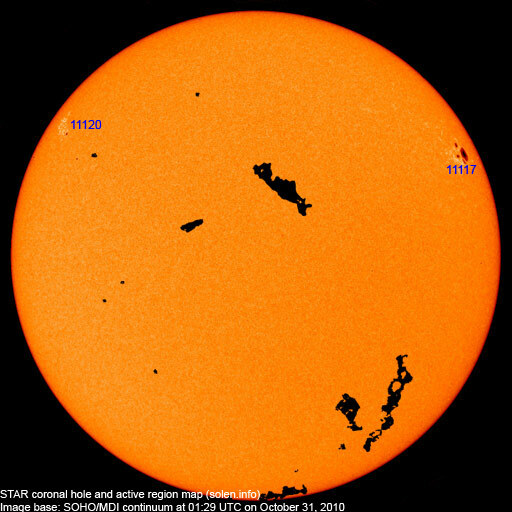 Another weak disturbance is possible today and on November 1 from the coronal hole extension that rotated across the central meridian on October 28. Quiet conditions are likely on November 2.